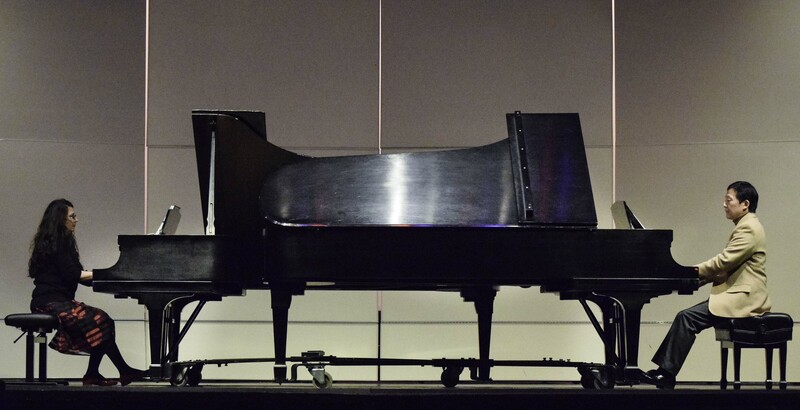 Anna Meassick | Professors Gayane Daraykan and Manabu Takasawa took the stage as the final act of the first music convocation of the semester performing a piano duet. 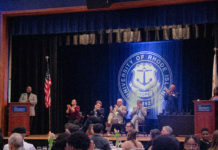 The University of Rhode Island’s Music Department has many different performances scheduled for all of the Rhode Island community to enjoy this semester. Music Department Chair Mark Conley oversees all of the different activities that occur and was able to share some of the different performances that will be offered for anyone to attend. Conley expressed that there are many types of performances the department holds. Besides the convocations, he explained that seniors also have their own recital every spring semester. He stated that these show students how it is when music majors are just about to step into the real world. Conley then proceeded to speak about some festivals that are occurring towards the end of the semester. Conley expressed multiple times that no matter who it is, any person is welcome to come to any performance the music department puts on. He wants everyone to feel welcome to appreciate all of the music the department works on. Nick Schleyer, a junior majoring in music education and performance, is pleased to promote some of the work students are doing outside of the music department. Schleyer said that he wanted to do something different and that could make music a little more entertaining for everyone. He wants everyone to be able to come this concert and enjoy music in new scenery. Schleyer looks forward to sharing his passion for music with the community and show what it means to him. By performing in different ensembles, he is given the opportunity to connect with his peers in a different way than others and that’s what he loves about being able to perform for all audiences. Both Schleyer and Conley expressed that any performance the music department puts on is for anyone. They encourage people to try out different performances to see which types of music they will like and just sit back, relax and enjoy music. The next performance held by the music department, will be a voice and piano recital on Feb. 8 at 8 p.m. and anyone is welcome. The admission will be free and it is held in the Fine Arts Center.